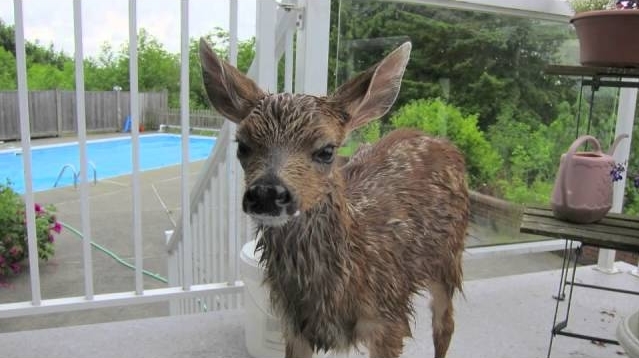 This poor little fawn was found in a pool “on its last breath” but was saved just in time. Watch the moments after the rescue, where the fawn is in terrible condition — shaking, dripping wet, and apparently scared out of its mind. The fawn allows human help and touch, but then appears to look for its mother. Fawn, so sweet and pure, are natural wonders of the forest. With their quiet and elusive nature, deer tend to be very protective of their young, but in order to survive, they may have to leave their fawn by themselves for a few hours to go in search of food. Fawn depend on their mothers to grow and thrive in their natural habitats. A fawn is born weighing in at about five pounds and will boast a beautiful red coat. This shade helps it blend in with its natural habitat -- the forest. White spots accompany the red coat of fur. The white spots will slowly start to fade away as the fawn reaches five months of age and begins to go through his first "molt," which is when he develops his winter coat. Responses to "Little Fawn Is Rescued, Nursed Back to Health, and Reunited With Mother"